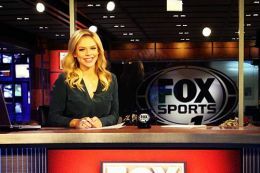 Julie Stewart-Binks is a journalist for Fox Sports, based in Los Angeles. She studied International Journalism at City, University of London and now works as a desk anchor, correspondent and host of Fox Soccer Daily, the football magazine programme. Julie recently travelled to Russia to cover the Winter Olympic Games in Sochi. It wasn't her first time at the games. When she was still a student, Julie financed an independent trip to the Vancouver 2010 Olympics to report for her own blog. What brought you to City to study for you MA in International Journalism and how do you think it has helped your career? After living in London, experiencing the culture and interning at Sky Sports and Sky News, I had an advantage over so many of my Canadian and American counterparts in terms of covering the beautiful game. It undoubtedly helped me get to where I am with Fox Sports today. What would be your advice for our current students trying to break into broadcasting?